We believe that everyone deserves to live in a healthy, wildlife-rich natural world and experience the joy of wildlife every day: for the wellbeing of people and wildlife. More and more people are living their lives indoors. We do not get to spend enough time in nature because often, there is nowhere nearby that is easily accessible. Those that have the least access to nature also have the worst levels of physical health and mental wellbeing. Seeing birds near our homes, walking through green spaces filled with wild flowers, and along rivers that are clean and clear reduces stress, fatigue, anxiety and depression. Decision-makers are not making the link between nature’s recovery, and our health, wellbeing & prosperity. 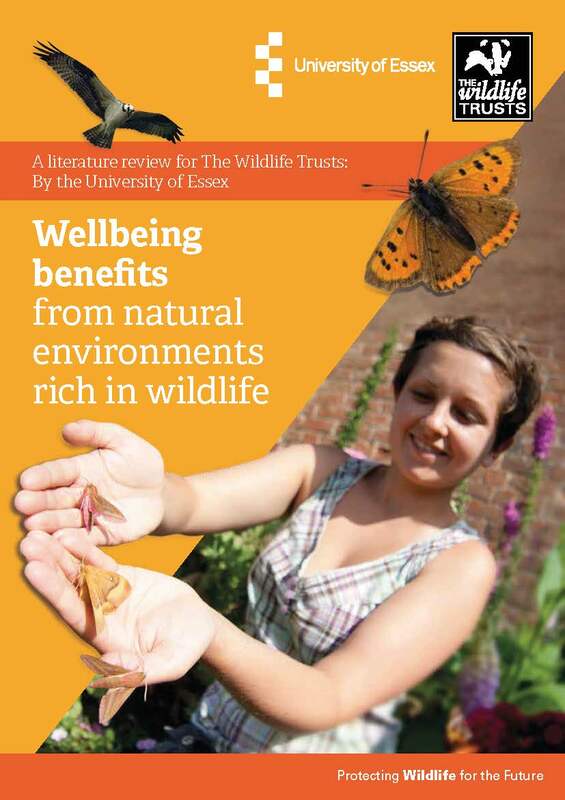 The Wildlife Trusts offer a different way of living. One which leads to happier, healthier lives and thriving wildlife. Those that have the least access to nature also have the worst levels of physical health and mental wellbeing. We want to make socialising, volunteering, exercise and play in wildlife-rich natural places central to everyone’s daily life. We have wonderful places where you can feel the benefits of nature first hand. Wildlife Trust reserves are also places where you can take gentle exercise without knowing it. The Wildlife Trusts run a huge range of activities – from weekly volunteering groups, to informative talks; and formal courses to family fun-days. What unites them is that they are great ways to mix with people from all backgrounds and ages. The Nurtured by Nature project is based at Severn Farm Pond Nature Reserve. It reaches out to people from all walks of life on a weekly basis offering them a chance to learn practical land management skills while gaining confidence and making friends. The large majority of Nurtured By Nature volunteers are considered as vulnerable adults and young people who either access mental health or special educational services. Weekly sessions are a chance for the volunteers to learn new skills in reserve maintenance and wildlife conservation whilst enjoying a healthy outdoor social opportunity. The sessions are successful at breaking down social stereotypes as well as developing support networks amongst a group of people who would not ordinarily meet up. This regular opportunity has played a significant part in moving the individuals towards independence. Lancashire Wildlife Trust run the MyPlace project in partnership with Lancashire Care NHS Foundation Trust. Together, they are reaching out to young people experiencing mental health issues by offering regular ecotherapy-based activities at green spaces throughout Preston, Chorley and East Lancashire. These activities offer young people opportunities to develop new skills and increase their self-esteem, therefore building resilience and self-confidence, while also improving environments for local communities. My Place is one of the 31 Our Bright Future, projects. Our Bright Future is a large programme of work that brings together the youth and environment sectors, which is giving young people a voice and helping them to take ownership of their future. Wild at Heart run by Sheffield and Rotherham Wildlife Trust, works with isolated older people aged 50 to 105 (!) to connect them to local green space and each other. The film below features some of the participants talking about the impact on their lives. Daily contact with nature is linked to better health, reduced levels of chronic stress, reductions in obesity and improved concentration. Engaging with the natural environment is also a great leveller. The Wildlife Trusts are rooted in their local communities and neighbourhoods, so we can help more people access local nature spots, reaching out to the full breadth of the people in the communities where we work. Wildlife Trusts work in partnership with health and social care organisations, to increase their reach, and better help the people they work with. The film below, featuring Jon, is incredibly moving and shows how engaging with nature turned his life around. The Wellbeing Programme offers weekly nature-based activities – like conservation tasks, nature crafts and walks at Wiltshire Wildlife Trust's nature reserves or other local green spaces. Owen joined in November 2015 following after suffering from post-traumatic stress disorder. He completed the programme and since finishing has become a Volunteer Support Assistant on one of the groups, helping the team deliver the activities that will benefit others who are struggling with mental health issues; just like they benefited him. Through the programme, I have gained a lot more confidence in myself and in my abilities. It's also helping me with building relationships; joining the programme has been the best experience of my life. We want more people to find that having contact with wildlife every day improves their mental wellbeing, and we want more people to care about and take action for wildlife as a result. 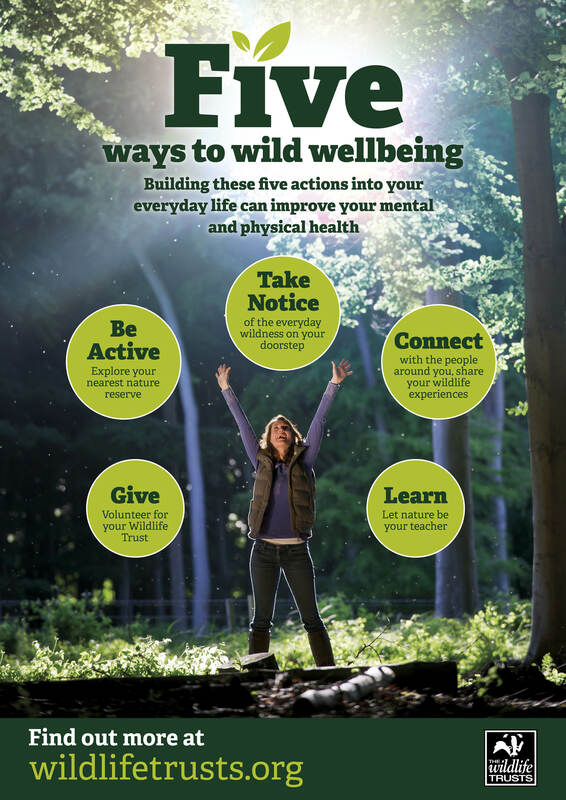 If you want to help too, why not take a couple of our 5 ways to wellbeing posters – and put them up in your GP surgery or pin it to your community notice board. Want to delve a little deeper? 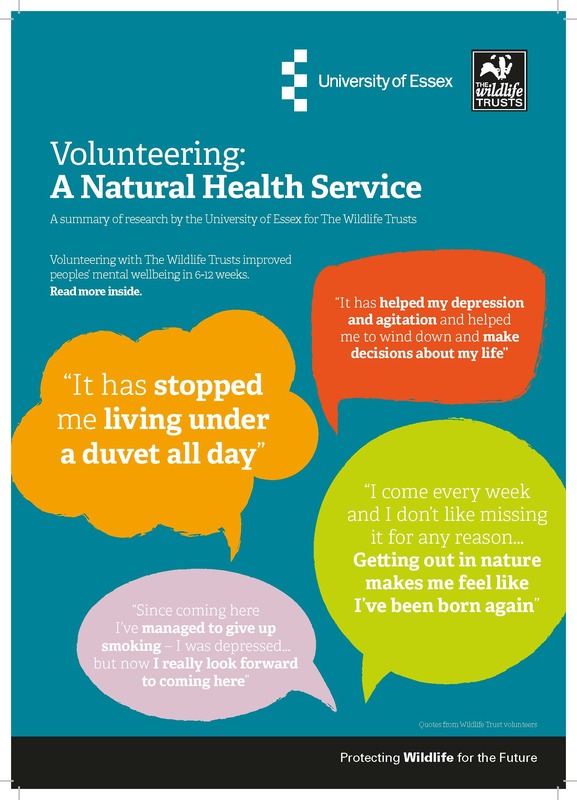 ■ Study the mental wellbeing of volunteers on Wildlife Trust projects. 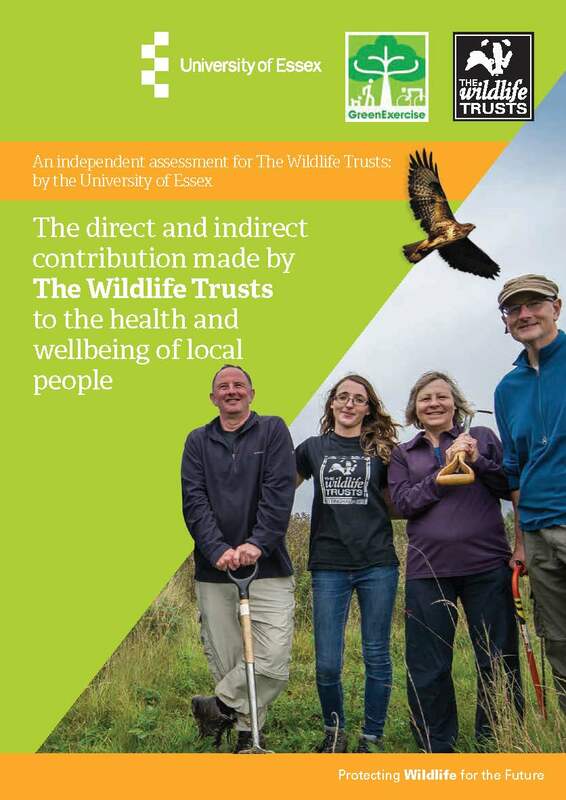 ■ Collect information from projects across The Wildlife Trusts to evaluate their impact on people’s health and wellbeing. ■ Review the scientific literature, to investigate whether nature-rich environments had any specific impacts on people’s health and wellbeing. The findings are particularly important for people who live with a mental health condition. 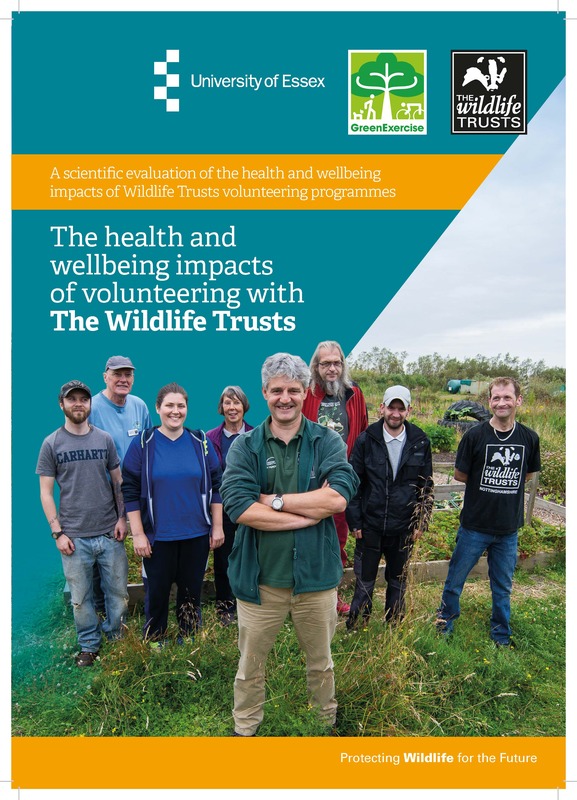 The research showed that nature volunteering had the most significant impact on those with low levels of mental wellbeing at the start of the project. Download and read these reports below.